Cooper had such a doggone good time when he interviewed Kelso, aka Special K, he could hardly wait to talk with Kelso’s big bro, Domino. Those 2 lucky dogs have such an active life with their Mum, Andrea (she’s an authentic dog whisperer! ), that it took a while to catch the devastatingly handsome Domino with a spare moment. Let’s just say, that when Coop & Dom got started, they didn’t want the fun to end! Cooper: Jeepers, creepers, Domino, where’d you get those peepers? Domino: They came free with my tuxedo suit! Many folks think they’re my best feature… but not those neighborhood kids who came to visit one day. They saw my eyes and ran away screaming! Cooper: Ha! Wish I’d seen that! What’s your story, you handsome creature? Domino: Well, as pound pups, we don’t like to talk about our “before” lives. Suffice to say I was a young buck out on the streets starving, dirty and cold, and ended up finding the loop of an animal control officer’s catch pole. A few hours later, shivering in a chilly, loud cage, I looked up and saw…. my new Mom! She said I looked like a starved cow with my bones and spotted coat, but adopted me anyways. Cooper: You lucky dog! What do you love best about your forever home? Domino: When I first moved in, I liked the mirrors and door springs. They were so fascinating! Now, I like Mom; warm, comfy beds; my toys; and regular meals. In that order. 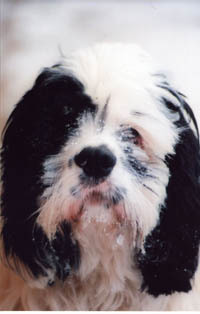 Domino: I’m a licensed therapy dog, and let me tell you, it is truly a calling – 24-7 and no vacations! My main job is to keep Mom’s blood pressure at a healthy level. I jump in her lap and roll around and act silly until she laughs, then I push my head under her hand until she pets me and de-stresses. This is exacting work – many dogs try this as amateurs – but I’m a trained professional! I encourage her to exercise – upper body workouts (throwing my toys) and cardio (taking me for walks). I also like to take Mom to visit our local senior home. Every Saturday when she goes to pick up her keys and my leash, I do my happy dance. I love going and seeing all my peeps! Cooper: I’d sure like a therapy dog gig — any advice? Domino: First, no biters allowed, little Coopster! When you master that you, too, can study hard and join this honorable profession… It’s SO rewarding! When folks see me, they holler “DOMINO!” Of course, they’ll holler your name, and that’s when you need to start doing a happy dance! When your owner lets go of the leash, run to them–that makes them feel happy. Then you sit down (still do the happy dance if you can), and smile at them. Then let them pet you. Cooper: Gee, I think I do that naturally! Domino: But the real trick, Coop, is to work the crowd so no one feels left out. Make sure everyone has a ‘hello’ and a pet! And take note: Many of them have treats, and they’ll give you lots of treats if you do a few tricks. Cooper: This is so much fun, Domino, could we continue this interview tomorrow?